﻿People seek purpose. We all want to feel that our efforts mean something, that they count towards something. We want to feel that we’re contributing towards something greater than the satisfaction of our own small desires. People give up high salaries to take on lower-paying roles that provide a clearer sense of purpose. People are proud to be volunteers in a way they are rarely proud to be an employee because they feel they’re contributing towards something that has genuine value. Purpose is a fundamental psychological need, and a key component of motivation. We need to feel our efforts are worthwhile. The most deeply motivated people are driven by a sense of doing something beyond themselves, and yet it remains something that feels deeply personal. They take on the larger good as their own. 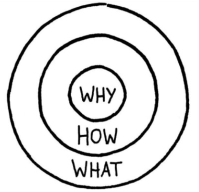 Simon Sinek’s wonderful book and TED talk Start With Why make this case. Organisations need to begin by uncovering why they do what they do. Only then should they proceed to describe the how and the what. If we simply articulate the what - ‘We make computers,’ ‘We sell coffee’ – we make work mundane and destroy all hope of tapping into people’s inner motivation. Want us to help your organisation uncover its purpose?